The 1960 Cruisers Inc. Seafarer’s topsides are stripped. That everything but loose fasteners throughout is in excellent shape is good news indeed. No structural work will be needed from this point forward. The caulked countersinks and the fasteners therein are another story, however. Testing with my awl told me that the caulk has failed throughout the topsides. A tiny pick with the probe ejects almost all of the caulk out of each countersink as a perfectly round cylinder. 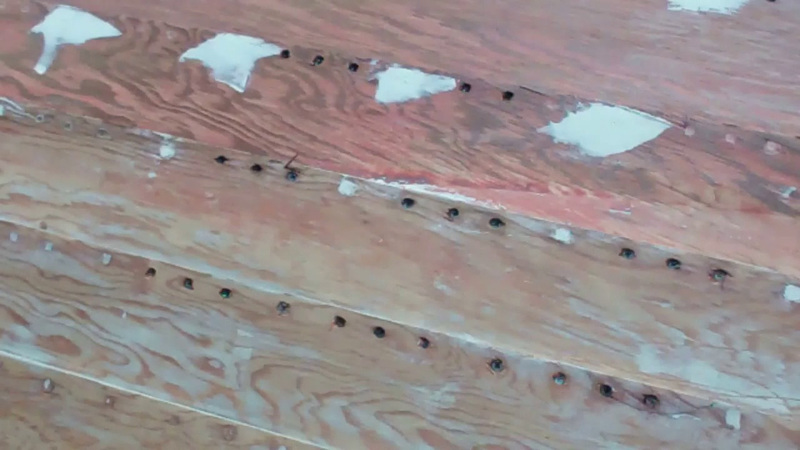 Additionally, and especially below and in the first two strakes above the waterline, many of the fastener heads had turned green, which indicates water infiltration. The adhesion between the wood and the caulk has failed throughout. The good news here is that, with a blast from the air chuck, most of the fastener heads are exposed and clean enough to screw back in place using a handheld Phillips screwdriver. Why not a mechanical screw gun? Controlling the force will be difficult and risk spinning the wood screws sunk into the ribs and force me to engage a time consuming toothpicking exercise. I have complete control with the handheld tool. The intermediate fasteners secure the strake edges to one another with a combination of machine threads backed by flat washers and hex nuts. I am able to tighten a full turn, and even up to three turns so far. The few intermediate fasteners that spin will be secured by RJ turning a deep well socket on the inside while I secure the screw from the outside. Next comes the 3M Premium Filler, sanding and fairing and sealing with multiple coats of CPES on the bottom and topsides. The bottom will be primed with three coats of Pettit Tie Coat Primer, followed by two coats of Pettit hard Racing Bronze bottom paint. The boot stripe will be done in fire red Interlux Brightside Polyurethane. The topsides will receive three coats of Interlux PreKote, followed by at least three, and more likely four coats of semi-gloss white Interlux Premium Yacht enamel. The transom and stem will be stained with brown mahogany Interlux Interstain, sealed and finished bright. Next PostNext 1946 Chris Craft U22 5200 Bottom Assembly is Launched!